Saving energy to save money—it’s a simple yet effective strategy that can greatly benefit families faced with the variable, often high costs of utility bills. It’s a goal made all the more significant to the Parsons The New School for Design and Stevens Institute of Technology Solar Decathlon team because the houses they design and build will serve as future residences for two families in the historic Deanwood community of Washington, D.C.
We’ve highlighted the efforts of this team—a collaboration of hundreds of students and supporting faculty from Parsons, Stevens Institute, and Milano the New School for Management and Urban Policy—here on the Energy blog before. While the team is hard at work completing construction of its house for the upcoming Solar Decathlon competition, it is simultaneously working with Habitat for Humanity to start construction of a second house in Deanwood. Post-competition, the two homes will join together as a duplex, providing affordable and energy-efficient residences for the community. The team officially broke ground on the project Wednesday. In addition to students and faculty, community residents, civic leaders, and government officials were on hand at the groundbreaking to support a goal to “create something that had a life beyond the [National] Mall,” said student team member Amanda Waal. “Bringing Deanwood and Habitat for Humanity into the discussions surrounding the Solar Decathlon has been very important to us,” she added. Like every Solar Decathlon team, the Parsons and Stevens Institute team has its sights on winning. Yet, even more, its goal is to demonstrate the benefits of energy-efficient design not just for the Deanwood community but also for the nation. “Changing housing in America—that’s really what we want to do as part of this competition,” said Joel Towers, dean of Parsons. The team’s strategy of using energy-efficient design principles to keep energy bills at the bare minimum for the long term is already catching on. 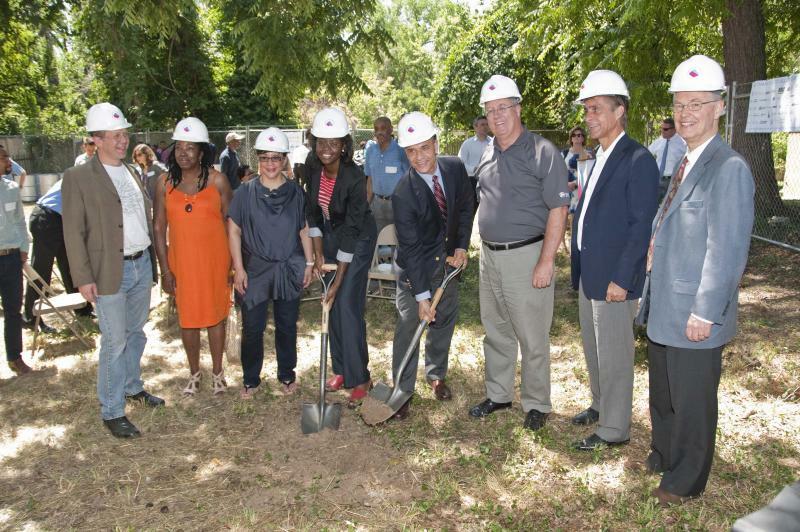 Habitat for Humanity is applying the team’s standards to six new townhouses in the Ivy City neighborhood of D.C., while other Habitat affiliates have expressed interest in replicating the formula in neighborhoods across the country. Solar Decathlon 2011 will take place Sept. 23 through Oct. 2, 2011, at the National Mall’s West Potomac Park in Washington, D.C.
Erin Pierce is an energy technology program specialist for the Department of Energy’s Office of Energy Efficiency and Renewable Energy. This entry was posted on Friday, July 1st, 2011 at 2:10 pm and is filed under Events, Parsons NS Stevens, Solar Decathlon, Solar Decathlon 2011, Teams.